Long after no NeXT hardware will function anymore, future generations will be able to have a ‘live’ peek at the NeXTSTEP OS (as opposed to still screenshots) via Madonna’s Rain video clip from 1993. I noticed it by watching the video on my Pocket PC and had to share it with you. Check in for screengrabs. There were 4 NeXT machines shown on the clip. machines that suppsedly handle the shooting of the clip. The first shot of NeXTSTEP on the video clip. 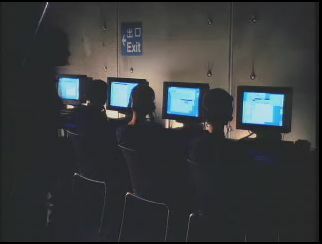 The second shot of NeXTSTEP on the video clip. The third shot of NeXTSTEP on the video clip. The next shots go back to Madonna. If they had to use a NeXT machine for 2 seconds showing a simple computer display instead of using MacOS or OS/2 or even a customized Win3.1 desktop that would have cost them close to $10,000. Heh, no wonder these videos cost so much. Knowing SJ, he probably paid Madonna to have NeXT shown in the video. Yahoo! requires Macintosh users to use Netscape 4.7? How insane is that? How would it have cost them so much? I mean, I assume this NeXT machine was a workstation the people who made the music video had around, or even used for their productions. Or were you not allowed to show off the computer at all? Usually they were using SGIs for video processing back then, not NeXTSTEP. It’s very possible that they either purchased or rented that NeXT machine for the video clip only. NeXT machines used to cost between $8000 and $16000 back then. If only the song itself wasn’t so goddamned awful. Here are some more nastalga videos of NeXT in action. This must have cost them at least $35,000 to $40,000. That was cruel and unusual punishment for two seconds. Excuse me while I turn on some Shins to flush my brain of that filthy music. Thanks for sharing the screen shots though. I personally think that SJ pushed some buttons to have this NeXT machine on the video. Why would the director (or producers?) spend hard cash for 2 secs of a video clip when he/she could have the GUI mimmicked in a fullscreen BMP? I know I could have one in about 5 minutes with any paint program. BTW, I’m into heavy metal, and I’m definitely not a Madonna fan, but c’mon guys, this song is not that bad. It’s better than any mainstream teethbreaker pop song of today! There’s a problem if a song needs a DJ or hiphop thing in the middle to catch on. NeXT machines showed up from time to time in the movies too. I vaguely recall seeing Rae Dawn Chong using a NeXT machine in some horrible sci-fi B-movie with Luke Skywalker himself, Mark Hamill. Hmm, judging from an IMDB search, it must have been “Time Runner” from 1993. Was that a Mystery Science Theater 3000 episode? Didn’t Ryuichi Sakamoto direct Rain for Madonna, he was an early synthesizer adopter so he was probably a NeXT devotee at the time like many Macheads in Apple’s non-SJ years. I’m just speculating here. Umm, that would prolly account for the top picture having “Exit” written in Kanji and the NeXT screenshots having “Madonna” written in Katakana. Anyone mind saying anything besides: Wow NeXt machines were really expensive? No, osnews is the same as always has been: a vehicle to feel good. I feel good about making others know about NeXTSTEP in a clip, so I do so. Having said that, if you want “better” articles, you are very welcome to send us in some. No one is getting paid over here, so we all do community work. So, I will be awaiting for your article. There were no BeBoxen in 1993. I knew there was a reason i studied japanese writing – the headline in the program on the second pic reads “MADONNA”. Now, that’s stardom. Getting custom NeXT software done for you. I don’t doubt that SJ had something to do with showing his desktop on the video. Does anyone recall a video by J-Lo where she displays, next to her ample and quite fetching derriere, a tangerine iMac in a pool? That won’t have been a coincidence either. I can’t comment on the quality of the articles in OsNews past, but it’s about OSs, it’s on topic. It’s OS use lite, but there’s enough articles on strange and weird Linux distros with references to the arcane art of installation and configuration for the real connoisseur. If you think Joe what’s-this-blinkenlights-do has any idea what you guys are talking about you should see their eyes glaze over after sentence two. /has seen it many times. It’s sad, really. Plus the site is run by a woman. And she’s Greek. I happen to like a good brain in a nice wrapper. Ok, I don’t know if you guys realize, but NeXT is dead. SJ won’t pay to put NeXT machines in a video clip. Maybe iPods or iMacs, but not a product that he doesn’t even sell anymore. It would be pretty silly to sponsor commercials for it. That song is from 1993 dude. I watched the video a couple of days ago (yeah, i actually like the song :p ) , and noticed the Next screens too. Never thought that would make it into a topic on osnews. Does anybody know if there’s a video clip out there that features Linux? That’ll be cool. Actually, I once saw the video of “The curtain falls” by Blue and for some seconds there was a cup of coffee in picture with a Debian sign printed on it. This really seems like it should be a /. article more than a osnews article. True, it is about an OS (sorta), but its not news anymore. 1993? Was it that long ago??? I remember noticing them first time around but was never really sure. Nice to have it confirmed. BTW Does it play on a Mac? I can’t get it to play even with i.e. Speaking of NeXT…..anyone have a Turbo Cube they wanna sell me? It’s been 12 years and… nothing has really changed since. Steve has always had that “cool” factor in his companies. I really like the song Rain by Madonna. I have a non-Turbo 25MHz 040 Cube. NeXT 400dpi laser printer, too. 64/2GB system with OpenStep 4.2. SCSI caddy CDROM where the dead Optical drive was. I probably should sell it off. It’s sentimental, though. It’s the machine that “The NeXT Book” was written on. I have such a hard time parting with cool equipment. I already have one of those along with my Turbo Color slab. The Turbo Cube is the pinnacle of NeXT engineering – I must have it! How about DURAN DURAN comeback or lets talk about Green Day’s new video or how cool britney looks. I come here everyday to read about OS NEWS about new technologies being added to real os not about what we saw in a music video they are all props not real. If I want to read that sort of stuff I might as well quick school stay home and watch MTV. The whole point here was, NeXT is a very unusual operating system showing up in a very unusual place; and the site is about operating systems. it is called product placement. it is no accident apple has so many computers in movie spots. they paid them to be there. And obviously has nothing to do with the number of creative people in Hollywood who write, edit and create movie assets on their Macs. Apple products show up in movies simply because their products are well designed and cool. I truely doubt apple pays for palcement. Set designers just prefer apple…because else looks like crap. Not in video clips, but I remember I read an article about KDE being used in a CSI episode or something, and nmap in Matrix 2.
os stands for operating systems. i still think this article is not revelant.oh look a nice little screen saver that looks like next is in a video,oh how cool. you might like that sort of stuff that is ok that’s why mtv exists, but i would rather read about technologies of windows 2003 server, linux,etc you kow stuff that matters. To many of us ”old Timers” NeXT is alive and well. I have a 33 mhz mono Turbo that’s waiting for a cdrom drive I just ordered and I use the ‘grandchild” of NeXTStep ,OSX on my day to day machine. I’d love a color cube with all the bells and whistles, but for now I’m going to get a bigger drive with OpenStep 4.2 installed. I think it’s great that OSNews comes up with a bit of nostalgia and keeps these great machines in the public eye..
Those screenshots show a GUI that is far better than any KDE/Gnome Lunix crap available at the moment. And that was well over 15 years ago! i think so, but I cant recall the bandname, it was sort of electropop like “Client”. the set is a white background alla matrix and there is a computer in the middle showing the words of the song with the Phosphor screensaver !!! Im sure it is phospor!!! Now im sorry I cant show you any proof. Try Windowmaker. It still looks exactly the same as those old NeXT systems. Personally I dislike that interface.